Yusuf Saad Kamel of Bahrain won men's 1,500m title at the 12th World Athletics Championships on Wednesday. Kamel, who was born in Kenya, won the gold medal with 3 minutes, 35.93 seconds. Ethiopia's Deresse Mekonnen won silver at 3:36.01 while defending champion Bernard Lagat of the United States only took bronze in 3:36.20. 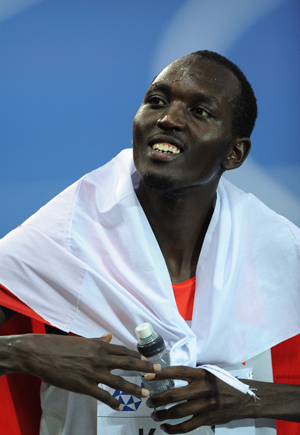 Kamel, 26, is the son of Billy Konchellah, a former Kenyan 800m runner who won two World Championship gold medals. "I'm really happy because nobody expected such a race today. Nobody expected Yusuf to win the world title," Kamel told reporters after the race. "I was confident that I can win because I had good times at 800 meters and I felt OK... My father won two world golds, now I want to get three to beat him," he added. 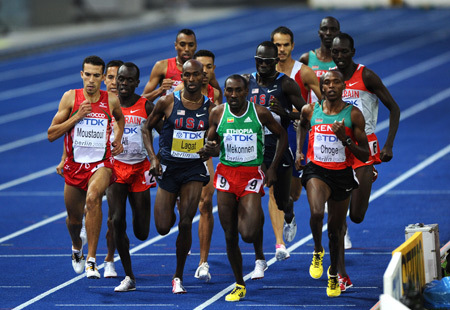 Defending champion Lagat told reporters that "it is disappointing to surrender the world title". "But I proved that I still can run with the young guys. I was able to come out here and got a third place," said the 34-year-old.